If you’re anything like me, you have little to no idea why Pokémon is suddenly making a HUGE comeback. I decided to see exactly what all the hype is about. Pokémon Go is an ‘augmented-reality’ game that launched last month. In a nutshell, the game lays a sort of semi-transparent Poké-world over your actual, geographical location, which you can explore by physically walking around while staring zombie-like at your screen (no judgement). The app makes the little Poké-monsters appear on your smartphone screen, through the camera, as you walk through your neighborhood –making it seem as if they are right in front of you as you collect them all. Pokémon Go is providing modern health benefits by getting people of all ages outside to exercise, explore, and meet other Poké players while hunting for the same creature. It’s now much more enticing to get those recommended 10,000 steps in a day! There are unfortunately some negative effects that are accompanying the game. The Poké lifestyle has become problematic for those who are chasing Pokémon a little too enthusiastically and not paying attention to themselves or their surroundings. There have been increased injuries, car accidents, and the one that REALLY troubles me as a chiropractor in Aventura…HORRIBLE POSTURE! Having bad posture does more than make you look bad. It can affect your health in many ways. While it’s a major safety concern to be unaware of your surroundings and always engrossed into your phone, it’s also a major problem for your body alignment and health. When you spend hours daily sitting with poor posture, or walking around with your head down as you track little critters on your phone, it takes a toll on your neck and spine. Feeling tight shoulders, headaches, neck pain, and less movement in your neck? You’re not alone. The Pokémon posture problems don’t stop there! When your head comes forward, generally your shoulders and upper back come with it. Now you’re not only starting to resemble the Hunchback of Notre Dame but also developing chronic pain that may turn into arthritis, herniated discs and stenosis. 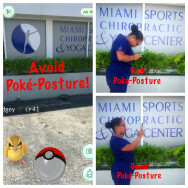 Want to chase Pokemons in Aventura without pain? See photo guidelines below. At Miami Sports Chiropractic & Yoga Center we teach you how to improve your posture and strengthen your spine to get out of pain AND teach your how to avoid future injury and diseases of the spine. So when you’re out there chasing after Pikachu and Charizard, remember to stand up straight and hold your head up high! Like what you heard? Let Us Help You!